Flaxseed, which also goes by the name of linseed, has been cherished as one of the most health-protective plant foods on the planet for centuries now. Going as far back as the Babylonian era, flaxseed was cultivated by the ancient Egyptians, making it one of the oldest fiber crops known to man. So many years down the line, these small, brown, tan, or golden seeds derived from the flax plant known as Linum usitatissimum continue to top the charts in terms of global patronage and health benefits. Along with being one of the world’s first cultivated superfoods, flaxseeds have been a medicinal favorite for the Ayurvedic school of medicine for the longest time. Flax or flaxseed oil can be found in a host of food products such as crackers, oatmeal, smoothies, baked goods, juices, milk and dairy products, muffins, dry pasta, macaroni, and meat products. More recently, there has been an unparalleled surge of flax-based products entering the market, and the consumers are just lapping them all up. There has been a simultaneous escalation in the agricultural use of flaxseed as well. Because these tiny, power-packed seeds contain a rich supply of omega-3 fatty acids, they are used as a major component of the chicken feed and the feed that is used when raising hens. Hence, the hens lay omega-3 rich eggs. While flaxseeds have gained much traction for their nutty taste and earthy aroma, they also have many health benefits to boot. Health experts do not tire of extolling the nutritional virtues of flaxseeds that account for its myriad disease-fighting and health-promoting advantages. The most important nutritional elements of flaxseed are ALA (an omega-3 fatty acid), lignans, and fiber. In fact, flaxseeds are the richest source of lignans, a plant-based compound that has both estrogen and antioxidant properties, with sesame seeds coming a distant second. Plus, flaxseed contains both soluble and insoluble fibers along with vitamin B1, protein, copper, manganese, magnesium, phosphorus, zinc, and selenium. Flaxseed is also gluten-free, so it is a valuable alternative to wheat if you are allergic to it or you suffer from celiac disease. Flaxseed comes in two basic varieties-brown and yellow or golden. It is readily available in the market in whole, ground, oil, or supplement form. If, however, you are thinking of using a flaxseed supplement to reap the bounteous benefits of this superseed, make sure to run it by your doctor. Also, one must always consume flaxseeds with ample amounts of water to avoid any undue digestive distress and store it in the freezer to preserve its nutritional potency. Pregnant women and breastfeeding mothers should avoid taking ground flaxseed or flaxseed supplements. 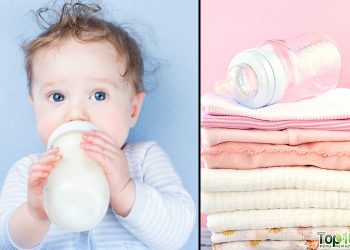 The phytoestrogens can adversely affect the development of the fetus and might predispose your child to cancer later in life. Breast, ovarian, or uterine cancer survivors must steer clear of flaxseeds as its phytoestrogens can engender adverse effects, such as growth of breast tissue. Similarly, women who have suffered in the past from hormonal-driven conditions, such as endometriosis and polycystic ovarian syndrome, should best avoid the phytoestrogen-containing flaxseeds. Flaxseeds can also negatively interfere with the action of birth control pills or hormone therapy as their inherent phytoestrogens can disrupt or double up the effect of the estrogen. Teenage girls and women under 30 should ideally restrict their flaxseed consumption to 2–3 times a week rather than taking it daily. Owing to its phytoestrogen content, flaxseed consumption is not recommended for infants and young children. People taking blood thinners should consult their doctor before taking flaxseed for health purposes as it can increase the risk of bleeding. Those suffering from prostate cancer, high triglycerides, hypothyroidism, and hormone-sensitive conditions should also take flaxseed with caution. Flaxseed consumption might interfere with diabetes medications, and therefore it is well advised to consult your doctor before incorporating flaxseeds into your diet. Even if the doctor green-lights the use of flaxseeds to stabilize your blood sugar levels, you must make sure to monitor your blood sugar levels at close and regular intervals. When taking flaxseed for health purposes, make sure to drink plenty of water; otherwise, it may cause gastrointestinal side effects. Do not take large amounts of flaxseeds as it may cause intestinal obstruction. It is also important to bear in mind that one can only derive the much-talked-about health benefits of flaxseeds if they are chewed properly, or else they will be rendered useless to your body. Particularly, for this reason, it may be useful to soak the seeds before consuming or simply have them in ground or powdered form. Besides, breaking down whole flaxseeds puts quite a strain on the intestines, which makes them the least preferable choice. Raw and unripe flaxseeds, on the other hand, are completely off-limits as their consumption can be toxic. 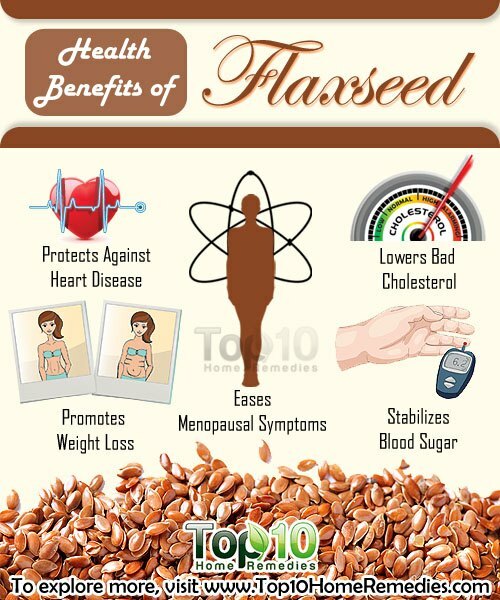 Here are 10 health benefits of flaxseed. Flaxseed is high in fiber, which is essential for a healthy digestive system. It can facilitate the passage of food through the intestines and even improve intestinal absorption of nutrients. The omega-3 fatty acids in flaxseed also protect the lining of the digestive tract and help maintain gastrointestinal health. Plus, flaxseeds and flaxseed oil work as natural laxatives that can alleviate constipation. However, when consuming ground flaxseed, make sure to also drink a good amount of water or it can cause side effects that could aggravate your tummy troubles and even cause intestinal blockage. Note: People suffering from diarrhea and chronic digestive disorders, such as irritable bowel syndrome, Crohn’s disease, and diverticulitis, should avoid flaxseed because of its laxative effect. Flaxseed contains many heart-healthy nutrients that can mitigate the risk of a number of cardiovascular ailments. It is rich in monounsaturated and polyunsaturated fats, including omega-3 fatty acids, which are important to keep your heart in optimal health. 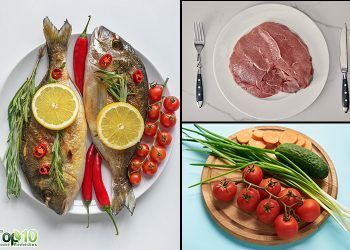 Large-scale epidemiologic studies suggest that people at risk for heart disease benefit from eating fatty fish and plant sources of omega-3. Some plant-derived omega-3 fatty acids are found in tofu, soybeans, walnuts, canola oil, and flaxseeds and their oils. Plus, flaxseed can stave off heart disease and stroke by reducing the buildup of plaque in the arteries and inflammation, which is known to promote hardening of the arteries. You can include ground flaxseed in your diet for a healthy heart. A 2013 study found that flaxseed can be very effective for menopausal women in fighting the symptoms of menopause. The lignans in flaxseed have estrogenic properties that can help reduce hot flashes, mood disturbances, and vaginal dryness. Furthermore, flaxseeds can help menstruating women maintain a regular cycle and promote fertility. While the optimum dosage to maximize these health perks of flaxseeds is yet undetermined, current health experts stipulate no more than 1 to 2 tablespoons of ground flaxseed a day. Regular intake of flaxseed can help bring down your bad cholesterol, or low-density lipoprotein (LDL), levels. A study published in Nutrition Research demonstrated the effectiveness of the daily consumption of 100 mg of flaxseed in reducing blood cholesterol levels and lowering the risk of liver disease in men with moderately high levels of cholesterol. Several flavonoids found in flaxseed help lower levels of LDL and may also reduce your risk of heart disease. Flaxseed also contains phytosterols, which are structurally similar to cholesterol and thereby compete with and inhibit the absorption of cholesterol in the intestines. Consume 2 to 4 tablespoons of ground flaxseed daily to help lower your LDL level. The three main components in flaxseed that aid in weight loss are omega-3 essential fatty acids, fiber, and lignans. Plus, flaxseed has B vitamins, potassium, magnesium, and zinc, which are essential in weight loss. Flaxseed’s capability as a weight loss agent was further highlighted by a study demonstrating the favorable effect of flaxseed consumption (>30g/day) on shedding the extra weight, observed among overweight and obese people. When it comes to weight loss, use ground flaxseed rather than the whole ones. Sprinkle it on your salads, soups, yogurt, smoothies, or any vegetable or mixed juice. Daily intake of flaxseed can improve blood sugar levels in people who have type 2 diabetes. A 2007 study published in the Public Library of Science One found that people who consumed flaxseed-derived lignan supplements (360 mg lignin/day) for 12 weeks had lower blood sugar levels. Plus, flaxseed has alpha-linolenic acid, protein, and fiber, which are important for controlling high blood sugar. Maintaining a normal blood sugar level can, in turn, prevent complications such as kidney failure and can reduce the risk of heart disease. You can consult your doctor and take flaxseeds along with your medicines to control diabetes. Keep monitoring your blood sugar levels to avoid the risk of hypoglycemia, or low blood sugar. The latest research from the American Institute for Cancer Research states that foods containing dietary fiber including flaxseeds may help lower the risk of colorectal cancer. In addition, studies do not support the idea that flaxseeds could increase the incidence of breast cancer. More research regarding their effect on prostate cancer is needed. Flaxseeds contain about 800 times higher lignans than any other food. The high levels of lignans found in flaxseed protect against breast cancer by blocking enzymes involved in the hormone metabolism that is responsible for the growth and spread of tumor cells. Plus, both ground flaxseed and flaxseed oil are high in alpha-linolenic acid, an omega-3 fatty acid that prevents the incidence and growth of cancerous tumors. You can add ground flaxseed to your yogurt or a smoothie. Also, add flaxseed oil to salad dressings and baked goods. The main purpose of detoxifying your body is to make sure harmful toxins, cholesterol, and other waste products processed by the liver are eliminated properly. Flaxseed contains both soluble and insoluble fibers that are very effective in flushing out toxins from the intestinal tract. Plus, flaxseed is loaded with essential fatty acids, particularly omega-3 fatty acids, which are essential for a number of cleansing functions and maintaining a healthy immune system. When your body is free of toxins, you are less likely to suffer from chronic fatigue, weakness, inflammation, and congestion. You can use both whole and ground flaxseeds for detoxification. Soak 1 tablespoon of whole flaxseed in 1 cup of water overnight. The next morning, eat both the seeds and gel. You can also add 1 tablespoon of ground flaxseed to any green detox smoothie. Flaxseed is rich in omega-3 fatty acids that nourish hair follicles to make them strong and healthy. The vitamin E in flaxseed provides nourishment to the hair roots, shafts, and scalp. Thus, flaxseeds come packed with wholesome goodness for your hair and help treat hair loss and prevent baldness. 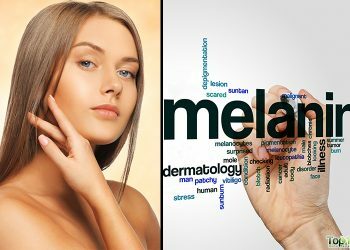 In fact, it can help people recover from psoriasis-related hair loss. So, include freshly ground flaxseed or flaxseed oil in your regular diet. 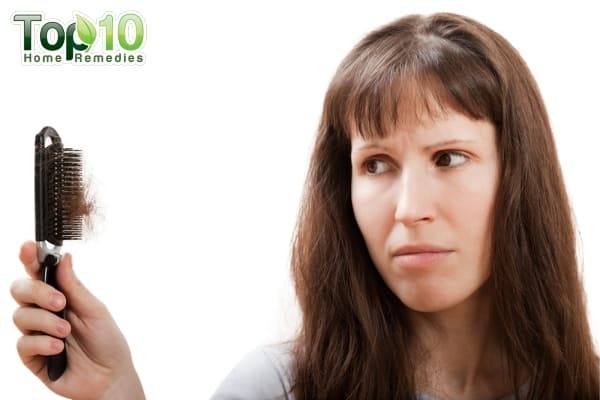 Those with curly and frizzy hair can also use a hair gel prepared by boiling flaxseeds in water. The healthy fats and B vitamins in flaxseed and flaxseed oil are beneficial for the skin. Flaxseed can help reduce dryness and flakiness and improve symptoms of acne, rosacea, eczema, skin allergies, and sunburn. Some animal studies suggest that the anti-inflammatory properties of flaxseeds can minimize skin irritation, rashes, tissue inflammation, and redness. Plus, the omega-3 fatty acids in flaxseed help keep your skin hydrated and smooth. Also, it can speed up the healing of skin wounds. Mix flaxseed oil with a few drops of an essential oil and use it as a natural skin moisturizer. Also, eat flaxseeds on a daily basis to achieve healthy and young-looking skin. Basic Report: 12220, Seeds, flaxseed. USDA Food Composition Databases. https://ndb.nal.usda.gov/ndb/foods/show/302604. Published April 2018. Goyal A, Sharma V, Upadhyay N. Flax, and flaxseed oil: an ancient medicine & modern functional food. Journal of Food Science and Technology. https://www.ncbi.nlm.nih.gov/pmc/articles/PMC4152533/. Published January 10, 2014. Katare C, Saxena S, Agrawal S. Flax Seed: A Potential Medicinal Food. Journal of Nutrition & Food Sciences. https://www.omicsonline.org/flax-seed-a-potential-medicinal-food-2155-9600.1000120.php?aid=4034. Published January 23, 2012. Prasad K. Flaxseed and cardiovascular health. Journal of Cardiovascular Pharmacology. https://www.ncbi.nlm.nih.gov/pubmed/19568181. Published November 2009. Etherton P- MK, Harris WS, Appel LJ. Omega-3 Fatty Acids and Cardiovascular Disease. Arteriosclerosis, Thrombosis, and Vascular Biology. https://www.ahajournals.org/doi/10.1161/01.atv.0000057393.97337.ae. Published February 1, 2003. Pruthi S, Qin R, Terstreip SA. A Phase III, Randomized, Placebo-Controlled, Double-Blind Trial of Flaxseed for the Treatment of Hot Flashes1:NCCTG N08C7. Menopause. https://www.ncbi.nlm.nih.gov/pmc/articles/PMC3246070/. Published January 2012. Nutritional Benefits of Flax. Healthy Flax. https://healthyflax.org/nutritional-benefits-of-flax. Fukumitsu S, Aida K, Shimizu H, Toyoda K. Flaxseed lignan lowers blood cholesterol and decreases liver disease risk factors in moderately hypercholesterolemic men. Nutrition Research. https://www.ncbi.nlm.nih.gov/pubmed/20797475. Published July 2010. Mohammadi‐Sartang M, Mazloom Z, Raeisi‐Dehkordi H, Barati‐Boldaji R, Bellissimo N, Zepetnek JOTde. The effect of flaxseed supplementation on body weight and body composition: a systematic review and meta‐analysis of 45 randomized placebo‐controlled trials. Obesity Reviews. https://onlinelibrary.wiley.com/doi/abs/10.1111/obr.12550. Published June 21, 2017. Flaxseed and Cancer Survivorship. American Institute for Cancer Research. http://www.aicr.org/patients-survivors/healthy-or-harmful/flaxseed.html. Sun J, Chen Y, Ye X, et al. Effects of a Flaxseed-Derived Lignan Supplement in Type 2 Diabetic Patients: A Randomized, Double-Blind, Cross-Over Trial. PLOS ONE. https://journals.plos.org/plosone/article?id=10.1371/journal.pone.0001148. Published November 7, 2007. Shim YY, Gui B, Arnison PG. Flaxseed (Linum usitatissimum L.) bioactive compounds and peptide nomenclature: A review. Trends in Food Science & Technology. https://www.sciencedirect.com/science/article/pii/S0924224414000697. Published April 18, 2014. Soltanian N, Janghorbani M. A randomized trial of the effects of flaxseed to manage constipation, weight, glycemia, and lipids in constipated patients with type 2 diabetes. Journal of Nutrition and Metabolism. https://www.ncbi.nlm.nih.gov/pmc/articles/PMC5944250/. Published May 9, 2018. Gutte KB, Sahoo AK, Ranveer RC. Bioactive Components of Flaxseed and its Health Benefits. International Journal of Pharmaceutical Sciences Review and Research. https://www.researchgate.net/publication/273441906_Bioactive_Components_of_Flaxseed_and_its_Health_Benefits. Published January 2015. Styrczewska M, Kostyn A, Kulma A. Flax Fiber Hydrophobic Extract Inhibits Human Skin Cells Inflammation and Causes Remodeling of Extracellular Matrix and Wound Closure Activation. BioMed Research International. https://www.ncbi.nlm.nih.gov/pmc/articles/PMC4539444/. Published 2015. Yang J, Min S, Hong S. Therapeutic Effects of Fermented Flax Seed Oil on NC/Nga Mice with Atopic Dermatitis-Like Skin Lesions. Evidence-Based Complementary and Alternative Medicine. https://www.hindawi.com/journals/ecam/2017/5469125/abs/. Published January 19, 2017. Splendid…will, certainly, start on this for its wonderful health benefits…..!